These viols are copied from English originals dating from the 1590s to the 1620s, by makers such as John Rose the younger (ﬂourished 1590s), and Henry Jaye (circa 1580–1640). These are the ideal models for the essential English consort repertoire by Byrd, Dowland, Gibbons, and their contemporaries. They are built very lightly, with no corner blocks or linings, and they have ﬁve-strip bent-stave fronts. Generally, English viols are made with soundposts, but I have also experimented successfully with making copies of the earlier viols of this type with a hypothetical soundpost-free setup. 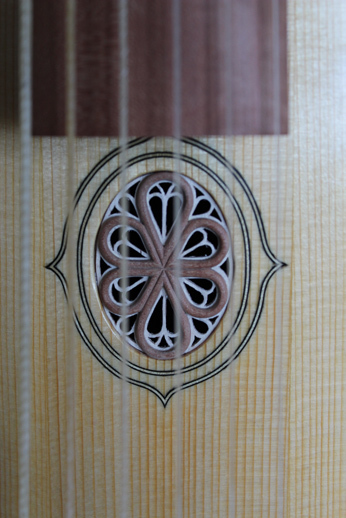 Extant and documented English viols of this period tend to be large instruments, partly because of the requirement for good response from plain gut bass strings. A “rule of thumb” for open string length is 400mm for a treble, 600mm for a tenor, and 800mm for a bass playing the lowest voice in the consort. Smaller basses also survive from this period, which may have been intended for playing divisions, lyra viol music, inner voices in the consort, or perhaps to be more manageable for smaller players, like a modern three-quarter size cello.